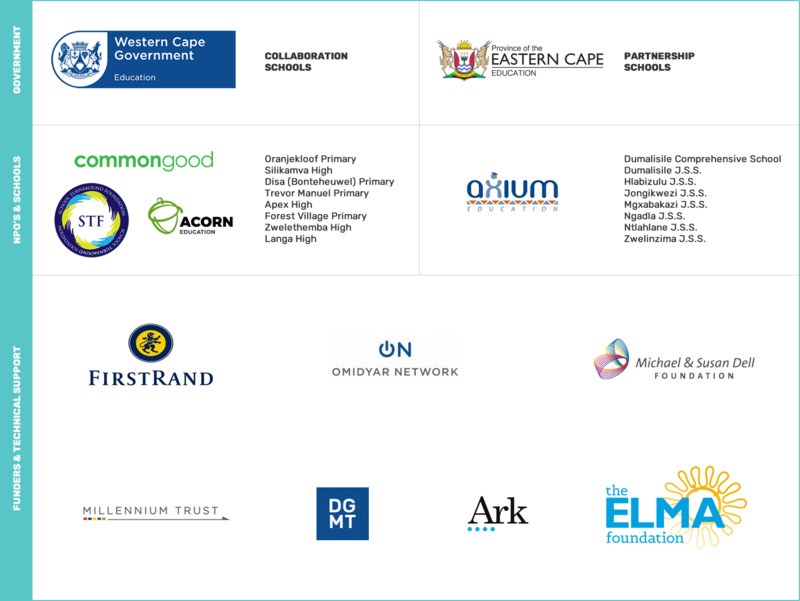 Public School Partnerships (PSP) is a collaborative approach to public school innovation that brings together government, funders, no-fee schools and non-profit education support organisations. PSP aims to bring additional expertise, resources, flexibility and greater accountability in school management into no-fee schools serving poorer communities in a bid to achieve greater equity in quality education in South Africa. Embedding a robust accountability framework so that government is able to track the performance of the school. Launched in 2016, PSP is in a pilot phase that ultimately aims to ascertain whether high-quality, non-selective education can be provided at scale and at similar cost to other public schools. PSP schools are non-profit, non-fee-paying, non-selective and located within the government system of schools. In essence, PSP schools aim to give children in the poorest and worst performing schools the same opportunity as any child in the best public schools by bringing new (non-profit) management and teaching expertise into the public system. In these schools, parents pay no fees and admission is non-selective. As a legacy of apartheid, public schools in South Africa are divided into two distinct ‘quality humps’. 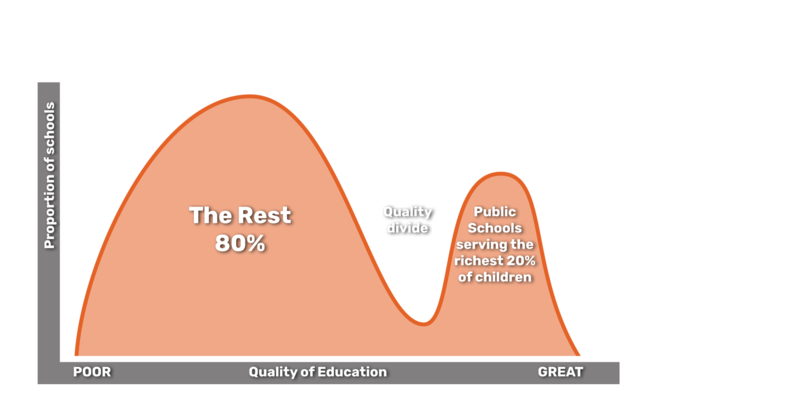 The big hump encompasses poor quality schools – almost all historically black. The small hump shows good quality schools – almost all formerly white. While the overall quality of education has improved a bit, patterns of inequality have not shifted since 1994. Most black children still can’t read or do Maths nearly as well as white children. In 2015, almost 1 000 high schools had Grade 12 pass rates lower than 40%. Fifty times more quintile one and two schools failed than in the richest quintile of schools. South Africa’s rate of investment in education ranks among the highest in the world, and the majority of our corporate social responsibility and philanthropic funding goes towards the education sector. Despite such considerable investment, international comparison tests show that a student learning in South Africa lags behind much poorer countries in Africa. This poor performance – and the gap between the rich and poor -will continue to widen until there is greater equity in the delivery of quality public education. So if we’re investing the money, why are poor schools still producing poor results? Poorer children often lack the nutritional, linguistic and cognitive foundations for learning. They are often harder to teach – but end up being taught by poorly trained teachers who are inadequately supported, in dilapidated schools in which poor leadership is further stifled by bureaucratic cultures of compliance. Additionally, schools serving these learners lack the social capital available in more affluent schools where the wealth, connections and input of parents, particularly those serving on School Governing Bodies (SGBs), translate into a wide range of advantages for both the schools and learners. 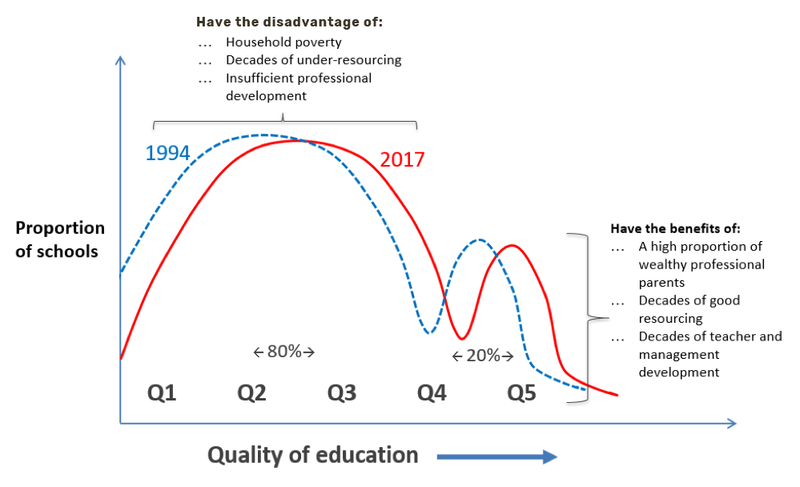 What will 2030 look like if we ignore this problem – and do not focus on the quality of education delivered to quintiles one and two? Public schools will be perceived as schools where poor kids go. The standard response is that teaching and learning must be strengthened in government schools, and that government regulation must be used to regulate the growth of the private sector to ensure that we don’t end up with public schools for poor children and private schools for those who can afford it. But if this is the full extent of our imagination, we’ll fail the children in thousands of public schools who are going to drop out or fail just because the system does not work for them. Systems-wide improvement plans must be supported by targeted interventions that try to change the dynamics that make schools fail. These dynamics relate to school leadership and management, teacher motivation and learner support. Source: Spaull N (2013). South Africa’s Education Crisis: The Quality of Education in South Africa 1994 – 2011. Report commissioned by Centre for Development Enterprise. management and the quality of teaching. NPOs are selected based on performance outcomes and contracted to partner with no-fee public schools by the provincial department of education with additional financial support from funders. Schools are identified by the government for support, after which the School Governing Bodies elect to participate in the partnership. Participating schools are given greater flexibility in curriculum, leadership and management. Through the School Governing Body, the partner organisation works with the school to create a vision and culture focused on achieving and sustaining high quality education outcomes. Additional technical capability is provided or sourced by the support partner as needed. Improving academic, financial and human resource management are key areas of focus for the new School Governing Body. In the Western Cape, the partner organisation participates in the governance of the school through a fifty-fifty partnership with the school-appointed members of the SGB. In the Eastern Cape, an Education Council comprised of representatives of the SGBs of all eight participating schools has been established for more efficient planning and resource management. The school partners also provide technical support to the school, working through the school’s management (principal and strategic management team). In the long term, several NPOs should be able to support multiple no-fee public schools simultaneously in order to stimulate collaborative learning and develop best practice. Does PSP represent public or private schooling? The South African government’s obligation is to ensure the delivery of basic education to children. Such delivery may be provided by government or by private providers. The state subsidises independent schools delivering schooling to poorer children by up to 60% of the provincial average expenditure per learner. There is political commitment to improving equity in educational outcomes; however, there are few institutional mechanisms for achieving it, other than slightly preferential per learner government funding provided to lower quintile schools. This leads to significant inefficiency in the allocation of public funds, with markedly lower outcomes for poorer learners, despite equal or even preferential funding. If dual outcomes of greater educational equity and efficiency are to be achieved, financing mechanisms must be accompanied by institutional changes that significantly improve the quality of education for poorer children. These changes are unlikely to be achieved through top-down circuit and district management improvement alone, and require day-by-day school-level intervention. The latter can only be achieved, on a large scale, through structural changes that fundamentally shift the current dynamics of under-performance in schools, particularly those that relate to school governance and management. Some groups have expressed opposition to the pilot project. The South African Democratic Teachers’ Union is of the view that this project could lead to privatisation of public schooling and the casualisation of teaching as a profession. Equal Education has expressed a similar view, adding that the level of investment in an initiative such as this could not be sustained over the long term. Schools are not being privatized, Western Cape tells teachers union, by journalist Bekezela Phakathi, published by the Business Day, 18 February 2016. What is the potential systemic impact of PSP? PSPs could help bridge the quality divide by increasing the proportion of government schools that are able to deliver quality education. If recognised as part of the government system, this could contribute to overall school improvement through knock-on systems of best practice. The value of PSP would be to harness strong managerial resources that currently reside outside of the public education system, and concentrate those resources in underperforming schools and in schools serving marginalised communities. In order for these gains to be fully realised, there is a need to realign the organisation of the education system, so that the main distinction is between government ensuring the provision of a public good (either through direct service delivery or financing) and privately provided education services (where wealthier parents and/or a third party pays the full cost). Simply put, any school receiving government funding should be viewed as a government school – regardless of the degree of devolution of management authority. Given the polarised income distribution in South Africa, independent schools that are not state-subsidised effectively target children of families in quintiles three, four and five, and not the poorest 40% of children. Over time, the perception that state schools are only for the poor who cannot afford better schools will be reinforced, unless there is a shift in the provision of education to children in quintiles one and two. If PSP targeted children in the poorest three quintiles of the population (i.e. with some overlap to prevent stigmatisation and to ensure a continuum of good quality schooling across all quintiles), they could be an important mechanism for achieving greater equity in educational outcomes. Collaboration Schools – concentrating energy and expertise in the poorest public schools, by DGMT CEO, David Harrison (First published in the Daily Maverick on 20 October 2016). How can Public School Partnerships be sustained? The biggest route to sustainability will be the costs saved in having far fewer children repeat grades. In one school alone, these costs to the Education Department were estimated at R40 million! If this wastage could be stopped, there will be far more money available to improve the quality of education. There are other long-term funding possibilities. For example, all private companies in South Africa have statutory obligations to commit funding to socio-economic development. This model provides a way of ensuring that these funds are used effectively and well monitored. Two years into the implementation of PSP, we have the first evidence that the pilot schools are now on a different trajectory to when they started. In the primary schools, the overall pass rate improved from 17% to 29% over the past year, while their average learner scores increased from 34% to 40%. Children in the younger grades showed the most consistent improvements. The biggest gains were in Grade 3, with one school showing a fifty percentage-point increase in its Mathematics mark. Perhaps most exciting was evidence that the overall distribution of marks – even among those children who still failed – is moving upwards. Fewer children failed badly, meaning that there is hope for them yet. At the same time, we cannot ignore the impact of home circumstance and traumatic events. At Silikamva High School in Hout Bay, a third of the learners lost their homes in the massive fires that swept through the Imizamo Yethu informal settlement in 2017. Many of them lived in temporary shelters on a school field for more than three months. Not surprisingly, the matric pass rate there dropped from 96% to 72%, compared to Langa High School, which increased from 34% to 49%. These figures reveal the dismal baselines from which we started, but the positive changes suggest that profound shifts in school dynamics are underway, and should become more pronounced over time if we continue to do the most important things differently. 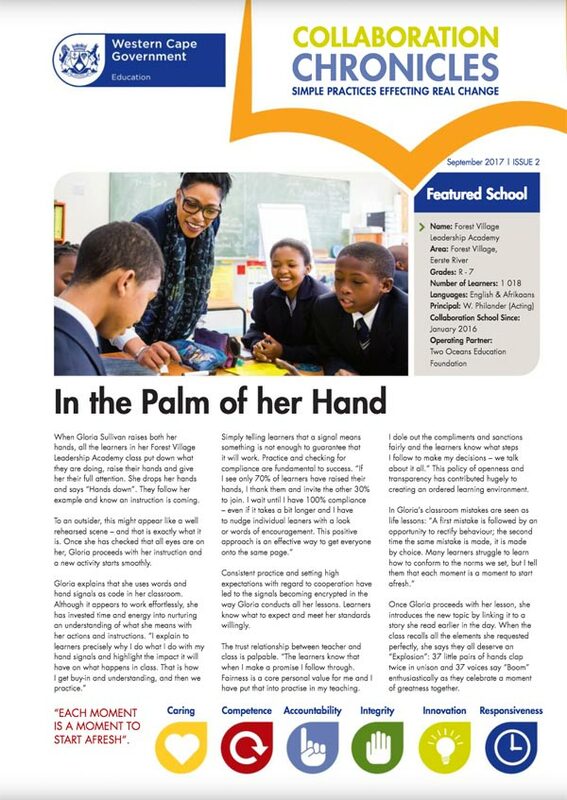 WCED’s Collaboration Schools Pilot Programme has a bi-termly publication featuring emerging learning from the programme. Read some of the favourite things and experiences by students at Apex High and Forest Village on posters they created in August 2018. Their parents also took the time to write letters sharing their experiences of sending their children to a Collaboration School. Access here. When provided with high quality resources learners from marginalised communities can make astonishing jumps, despite the low expectations of their teachers. 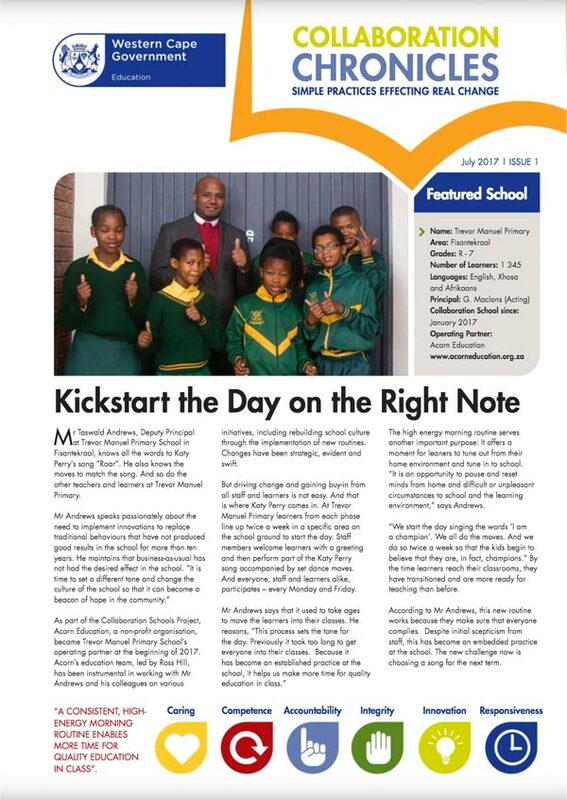 This was demonstrated at Oranjekloof Primary where the proportion of Grade 3’s who passed maths increased up by over 50 percentage points in just one year. Our partnership with government has highlighted the dire realities in some of the worst performing schools, and galvanised the education department in the Western Cape to act differently. As a result, human resource management is being fast-tracked to develop or discipline underperforming teachers. When properly consulted, parents want to try out new ideas. They won’t cede ultimate control to anyone else, but they’re willing for competent non-profit organisations to manage the schools with them. Parents have given a clear ultimatum to school operating partners: deliver on your promises, or you’re out. In the toughest schools, teachers are not split on trade union lines, but between those who want to do their jobs as well as they can and those who don’t. To innovate takes more effort and requires far more time and commitment from government than business as usual. Introducing additional stakeholders and trying new things requires a great deal of hand-holding at the outset especially and the capacity for joint problem solving as unanticipated issues arise. Our government partners have most definitely not walked away from their schools. Is this initiative a way to privatise public education? No. Public school operators will always be non-profit organisations accountable to provincial government for their performance. Actually, both Government and Cosatu have already accepted that some publicly-funded services can be provided by either employees of the State or the private sector. Over 70% of the work of the Department of Social Development is contracted to NPOs, and low-fee independent schools may obtain a per capita subsidy of up to 60% of the equivalent allocation in public schools. PSP is the opportunity to build genuine and sustainable partnerships that bring new expertise into government schools without the profit motive distorting public provision. Change takes time, is it justified to try something extreme, should we not be patient and wait for the school system to improve over time as better-trained educators enter the system? Do parents really have a choice in terms of their school’s participation in the pilot? Critics of the pilot project scoff at the idea that parents might turn down extra funding and suggest that there’s really is no choice being offered at all. That is a patronising view. After two years of working in these schools, our experience is that parents know what they want and agonise over the risk of their children being let down yet again by empty promises. Interestingly, parents at the most politicised schools have opted for a “fifty-fifty” relationship on the SGB, making it clear to the school operating partners that they will be equally accountable for the failure or success of the school. Read more: The public school partnership pilot – is it worth it? Let parents decide. By DGMT CEO, David Harrison – First published in the Cape Times on 2 November 2017. Do teachers who work at PSP schools lose their benefits? No. If they’re already employed in existing schools, they stay on the departmental payroll. In new schools, the provincial government pays the school the equivalent of their salary and benefits. What is the role of the funder group? Providing a range of philanthropic support to the pilot (e.g. start-up costs, operating costs). Do you really think this initiative will sustainably improve quality in these schools? Sceptics point out that the initiative costs extra money and may not be sustainable over the long term. Maybe, but we will save millions of Rands by not having to teach the same children the same lessons twice because they no longer fail – at the moment 1 in 10 children will have repeat a grade at least three times. That will free up a lot of money into the system, and perhaps open new pathways to sustainability. That said, this intervention is a pilot, and as such we not sure that it will work, because the learning gaps between rich and poor children are already so pronounced by the time they enter school. But, we are sure that the idea is worth trying. For that reason, we’ve appointed an independent team of evaluators to assess impact and cost-effectiveness. On its own, this incremental innovation is not radical enough to transform the education system. But, it could nurture a new branch of public education to be grasped by thousands of children now entering school who are destined to fail because nobody really expects dramatic changes in the education system over the next decade. Unquestionably, part of the solution is doing what we do better. Part of it is doing things differently. We must therefore resist the instinct to nip off promising new shoots for fear they morph into something else. Change requires courage, imagination and trust – and trust can be built if we put children’s interests ahead of our own.